A slender marble kitchen worktop, and built-in beige and white cabinets are intended to be hardly noticeable in this San Francisco apartment designed by Californian studio Garcia Tamjidi. Private Residence 4 is the second home of a banker, whose main residence is just outside of San Francisco, but who needed somewhere more central to stay when working late. Located on the 12th floor of its building, the apartment boasts impressive views of the city, and sites including the Golden Gate Bridge and San Francisco-Oakland Bay Bridge. Inside, Garcia Tamjidi Architecture Design employed its signature minimalist aesthetic to create a place of respite for the resident, following the style of its earlier Private Residence in the city. White-painted walls and dark engineered oak flooring feature throughout the home, which includes an open-plan living, kitchen and dining room, two bedrooms and three bathrooms. A suite of neutral-toned storage cabinets are built into the walls to allow for plenty of storage with little clutter. The units are either painted white or fronted with a beige veneer so that they "almost – but not quite – disappear into the background". "White-painted cabinetry and the occasional beige veneer contribute to an architecture that is suffused with subtlety and blending, and that begins to speak only as much as the visitor wants to see," said Garcia Tamjidi. The studio employed a playful approach to the cabinet design, from an elevated volume that forms a desk to nooks for sculptural objects. White cabinets are also lined with cedar to offer a darker contrast. "The magic is in the details," said the studio. In the open-plan living space, a white credenza matches the size of a large recess at the base of the television unit, erected on the other side of the room. All of the kitchen storage and facilities are also contained in veneered units, and an island topped by a slender raised marble counter. To continue the simple aesthetic, the space is furnished with few pieces, in subtle tones of brown leather, dark wood and grey. 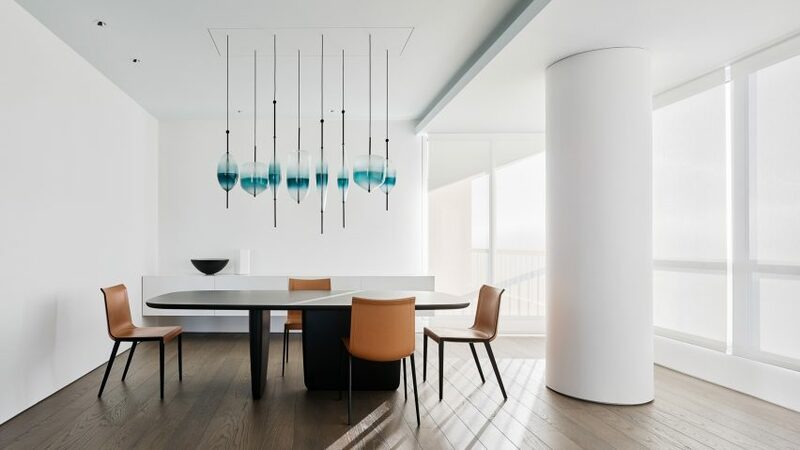 But the wooden dining table, which is set beside a chunky white column, is topped by a blue light sculpture by designer Nao Tamura for Wonderglass that offers a contrasting pop of colour. Doors also lead from the dining area to an outdoor terrace, for vistas that take advantage of the apartment's elevated position. 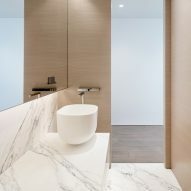 While cabinetry continues into the two bedrooms, white marble becomes the more prominent material in the "ultra-luxurious" bathrooms. 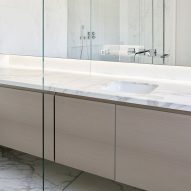 Mounted slabs form a sink in the guest bathroom and a bench in the master bedroom's shower, which is then encased in glass. "That same marble lines all of the surfaces, creating one continuous visually velvety look and feel," Garcia Tamjidi said. The firm was founded in 1998 by architects Michael Garcia and Farid Tamjidi, who met while studying at UC Berkley's school of architecture. The studio has completed a series of projects in San Francisco that bear a minimalist approach. 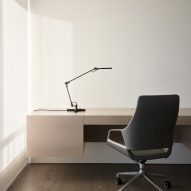 Another private residence in San Francisco is so stripped back it looks more like an art gallery or showroom, and an office for beauty brand incubator Kendo features a monochrome palette.